Out of this AATI ACTU AG AMED ATHR ELMG SNWL SSRX TXRH UA , have recent catalyst. This being earnings season in many of these cases the catalyst is earnings. As the overall market consolidated for some weeks, many stocks in IBD 100 pulled back. Now some of them are breaking out. Now those who are following the one month weakness to time entry in IBD 100 system which I talked about couple of times last month would find many attractive breakouts. These stocks have a 4% breakout plus month price growth of less than 10%. You get best results for IBD 100, IBD 200 or Double Trouble system after a overall market weakness. Overall market weakness acts as a drag on high performing momentum stocks, where they have orderly pullback, once the market starts rallying again, they rebound. For playing the swing, that is the sweet spot for low risk entry. With the Mumbai Sensex crossing 20000 level yesterday, Mukesh Ambani for the time being is the richest person in the world. 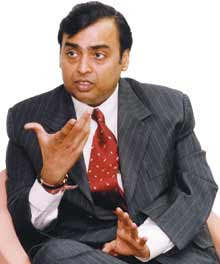 Following a strong share price rally today in his three group companies - India's most valued firm Reliance Industries , Reliance Petroleum and Reliance Industrial Infrastructure Ltd - the net worth of Mukesh Ambani rose to $63.2 billion (Rs 2,49,108 crore). At the beginning of every earnings season, bears put forth the argument, earnings are going to be bad, for over 20 quarters they have been wrong. See the current earnings trends from Zacks. So far, 37% of the S&P 500 firms have reported (185 companies). The results have been better than most have feared, and over the past few days the results have been getting better. The median year-over-year growth rate has climbed sharply. We are now back in double digits, which if maintained would make this the 21st straight quarter of double-digit growth. Just last week, the median growth rate stood at 7.14%, the surprise ratio at 2.1:1 and a median surprise of 2.90%. Well, in just a few days, the median growth has jumped to 10.6%, and the surprise ratio to 2.56:1. The median surprise has declined slightly to 2.70%, but that is still a very healthy level. While the surprise ratio is still below the 3:1 that we have come to expect, it is not that far away anymore. Every sector now has more positive than negative surprises. Energy is now in the lead with 25.8% median year over year growth. That, however, should fade since the unreported firms in the sector have a median expected growth rate of -7.3%. Both Energy and Telecom, which holds the number two slot on the leader board, have had relatively few companies report. Health Care might be having the most impressive earnings season overall, with a median growth rate of 18.7%, a surprise ratio of 4.67:1 and a median surprise of 3.30%. CXO Advisory group has done a chapter by chapter summary of The Little Book That Makes You Rich: A Proven Market-Beating Formula for Growth Investing, Louis Navellier. I am currently reading this book. The CXO summary is excellent. While on that blog check out their other stuff. It is one of the best source for proven strategies and insight in to latest research. That looks like a very good breakout on WFR after long consolidation. It is a play on alternative energy sector. The market is at interesting crossroads. The correction in progress is leading to lot of stocks breaking down. While at the same time there is clear and visible rotation in to technology stocks and growth stocks. Good earnings are being handsomely rewarded. The question is , can a narrow focused rally continue. Yes, in the past such rallies have persisted much longer than anyone anticipated. The shorter term picture looks risky because of daily gyrations and lot of selling in numbers of stocks with individual issues or those which had peaked in their earnings. So short term how much selling is still their is the question. Yesterday the market reversed again after a dose of morning selling. That strength has to persist in to broader reversal. Today the market has a catalyst in the form of MSFT earnings to take us higher. The weakness of 5-6 days has set us up for a possible bounce. The FOMC meeting will be eagerly watched and market participants will try and position themselves ahead of that event. Given current conditions a rally in to that period or post that period is likely scenario. But till the market tips its hand preserving capital is important, because any more selling at this stage sets us for accelerated selling in many names. So overall many of my short term indicators or Market Monitor are at stage where they look risky for market, but longer term indicators are still in positive territory. The GMI rose to 5 (of 6) and the GMI-R to 90%. There were 189 new highs and 165 new lows in my universe of 4,000 stocks. But my very short term indicators look horrendous with only 13% being positive. A close of the QQQQ below 52 would be a serious break in support. If the bounce in the QQQQ from MSFT's rise does not keep the QQQQ up on Friday, I will become very defensive. Something about this market really bothers me. Can techs continue to resist the downward momentum in the other stocks? Or will another reduction in interest rates by the Fed next week bring them all back? I still think the best place to be right now is mainly in cash. Market has not been acting well. It is extremely tough environment to trade in . Unless you are in it for very short term trades and earnings trade, most things are not working. We are possibly heading in to trouble. The Episodic Pivots on bearish side are fast rising today with several stocks falling more than 8%. As of now there are around 90 EP's on bearish side. The stocks up 25% in month ratio is about to turn. This does not look good. Often it signals downturn. Stocks down 50% plus in month is rising. The action does not feel and look good. So better to protect capital and fight this battle another day.